Dairy products often get a bad rap when it comes to losing weight. Dieters usually shy away from the grocery store’s dairy aisle because milk, cheese, yogurt and other dairy foods can contain lots of calories and high levels of saturated fat. However, studies have shown that dairy can help you lose weight, especially the dangerous fat so many of us carry in the middle of our bodies. Higher dairy consumption is actually associated with lower body fat, lower body weight, lower insulin resistance and better cholesterol levels. Some studies have shown that dairy products can increase your metabolism while slowing down the formation of fat cells. Foods rich in calcium also have the added benefit of possibly lowering blood pressure, especially in adults who typically haven’t gotten a lot of calcium in their diets. Make smarter choices to give your body the benefits of dairy without risking weight gain. Aim for three to four servings per day, but opt for reduced-fat versions of your favorite full-fat dairy products. You’ll be surprised at how easy it now is to find low-fat options. You can buy one percent or skim milk and feel free to drink a glass or two daily. It may take you a few days to get used to the different consistency of low-fat milk, but eventually it will taste normal to you. Using low-fat dairy substitutions in recipes is even easier because you probably won’t even notice the missing fat. Start slowly by trying low-fat cream soups, cream cheese and fat-free butter alternatives in your recipes. Instead of ice cream, enjoy a guilt-free bowl of fat-free frozen yogurt for a snack or dessert. 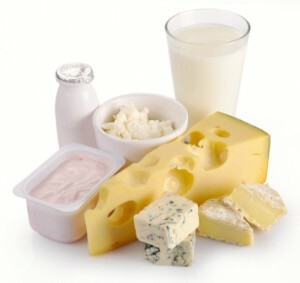 Dairy products positively impact your diet because they provide vital nutrients your body needs to function well. These nutrients include protein and calcium plus vitamins like D and A. Most low-fat versions of milk, cheese and yogurt contain the same amounts of those important nutrients as the regular-fat products, so you can feel good about saving fat and calories by substituting with reduced-fat dairy foods.